Revealing Priceline Express Deals is even easier than identifying Hotwire hotels. Plus Priceline is cheaper than Hotwire 90% of the time and they don't inflate star ratings. We'll be going over the different parts of the above image labeled in red to explain what's important. Make sure you clicked on the Express Deals tab so you're looking at the list of opaque hotels, not the already named ones at retail rates. Note the star rating of the hotel. The retail hotel will have the exact same star rating. Keep track of the area the hotel is in. The area is slightly grey and under the star rating. Note the hotel price and the crossed saving percent above it. The guest rating will be on the bottom. if it's 8+ that means you're looking for a hotel in the 8 to 8.9 rating. If no rating exists it means the hotel is not rated well or very new. You should note down the amenities by clicking on Hotel Amenities. Most of the time you don't even need these but it's good to verify correct identifications. Go back to the "Browse ALL HOTELS" tab and fill in the information about the Express Deal hotel on the filter toolbar on the left. You'll want to set the star rating, and area. 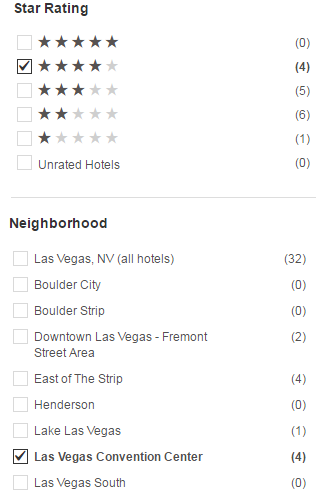 You can set the Hotel Amenities as well if you want to narrow down a hotel further. The results on the right are the potential hotels for your Express Deal. Where %discount would be a number between 0 and 1, such as 0.09 for 9%. Whichever named hotel has a retail price closest to this original price value is likely to be correct. Usually the prices are exactly the same or within a few bucks of each other. 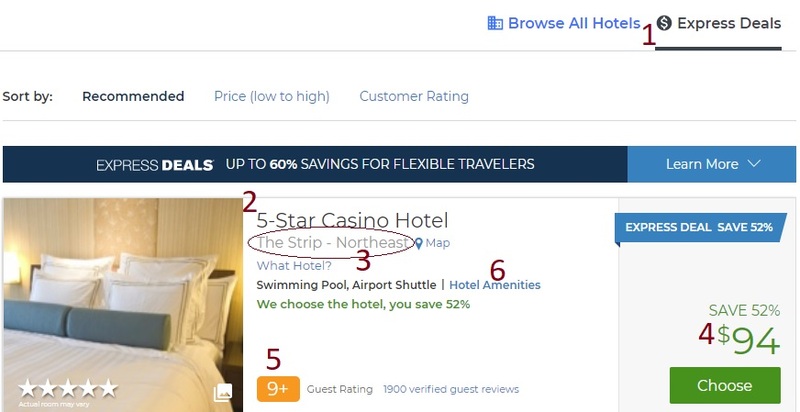 Now that you have filtered the results according to star rating, area, retail price, amenities, and guest rating there should only be 1 hotel your Priceline Express Deal could possibly be. If everything matches up and there are no other possibilities then you can have very high confidence on what hotel you will get when booking an Express deal on Priceline.